Do you know you can greatly enhance and brighten your furniture by adding some cushions and pillows to it? Instead of throwing out your old furniture, try changing the cushions and adding some throw pillows of different sizes and colors. This is especially true for outdoor furniture as outdoor cushions and pillows tend to disintegrate over the years of outdoor use. Outdoor cushions and pillows can become unsightly as mildew and molds start to grow on them. Our outdoor cushions are made with high performance tapestries from Sunbrella®. Sunbrella colors stay strong and vibrant, even through intense sunlight exposure, rain, and snow. Sunbrella fabrics are as soft and inviting as they are durable. Sunbrella resists stains and fading, so you can stop worrying about your fabric and enjoy your life. Use the drop-down list to select your cushions. 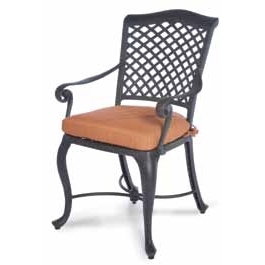 This list includes only the patio furniture we sell here in our store. If a furniture is not listed, please type in the furniture code and name in the boxes given. We can still make cushions for furniture not sold in our store. If you know your cushion measurements, input the dimensions in the given dimensional boxes. Provide us as many details as you can in the 'Instruction Box'. Please note also that all custom cushions are prepaid and cannot be returned. If in doubt, please contact us before placing an order. 2 optional types of welting: self-welt (same fabric) and contrast/complementary welt (different color). If contrast/complementary welt is chosen, we may use ready-made colored cords. Note: All measurements are approximate only. All our customized cushions are hand-stuffed to ensure all the edges are well filled and give a high quality appearance. Specify welt color (if chosen). Self-welt (same color) if not specified otherwise. Use instruction box to indicate your preference. The Sunbrella® cushions are made to order. They may take up to 3-4 weeks to ship depending on the work volume of our workshop. Sunbrella® fabrics are manufactured by Glen Raven, Inc. headquartered in Glen Raven, North Carolina. Sunbrella® is the result of over 45 years of ongoing research and development. Sunbrella's UV-resistant color pigments are fully blended into its high performance fiber. Sunbrella® fabric's strength and color refuses to fade even under the harshest conditions, while retaining the softness of spun cotton. Sunbrella® Furniture fabrics are designed to be breathable and water repellent. They do not absorb water and are designed to air-dry very quickly - usually within a matter of minutes. Sunbrella® furniture fabrics have been tested and proven to provide up to 98% UV protection from harmful effects of the sun when used in shade applications. Sunbrella® furniture fabrics have been awarded the "Seal of Recommendation" by The Skin Cancer Foundation, an international organization dedicated to the prevention of skin cancer. All fabric cushions are warranted to the original purchaser for a period of one year from the original date of purchase. This consists of the cushions being free from defects in material and workmanship. This warranty does not cover fading of fabrics, damage caused by ammonia, harsh abrasive cleaners, pool chlorine, suntan oils, blocks and/or lotions, mold, mildew, neglect or from lack of providing reasonable care and maintenance. We cannot guarantee any replacements to be 100% consistent with your existing item(s). All cushions can be cleaned by first brushing off any loose dirt, then with a mild soap and water mixture brush them clean. Make sure to use a soft bristle brush or sponge and allow to air dry. Hand wash only and hang to dry. Do not use a washing machine or dryer.